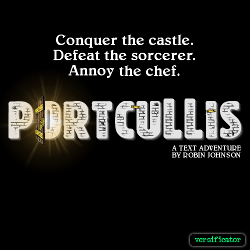 You are a citizen of the coastal town of Portcullis, which has recently been taken over by an evil sorcerer. A party of four rather arrogant professional adventurers has arrived in town hoping to dethrone him. This game was written for the 35th anniversary of Zork, and as such has a deliberate old-school feel, with a greenscreen look and a drily comic fantasy setting. Downloadable zipfile for offline play. This page was last modified on 15 April 2019, at 18:41.